Hooray! My new story Breathing is out today in Aurealis #95. This one is science fiction, which is a bit unusual for me. I’m still figuring out how to describe it. This is one of those stories that grew out of my response to a song. I’ve got a few like this. I often find my way into a story through the mood generated by music, or an evocative lyric. I’m a particular fan of using crazy word associations through misheard lyrics (or mondegreens) to spark my creativity. That line is intriguing. It is rich with unacknowledged tragedy and cruel revelation. I’ve since found out there is a sad story behind Hello: it was written by the multi-talented Evanescence frontwoman, Amy Lee, about an early tragedy in her life. But I didn’t know that when I wrote Breathing. I won’t say any more (spoilers! ), but if you read the story, let me know what you think! Great story. Congrats and well done. Reminded me a little of Marissa Meyer for some reason, which is a good thing in my household. We’re fans of hers. I also use music, not so much for ideas as for mood. Hey, Chris! Thanks. 🙂 It’s definitely a good mood builder. 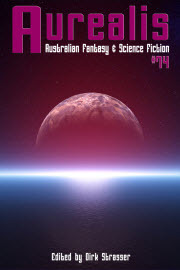 I haven’t seen the TOC for Aurealis #95 yet (issues with my Kobo) – do you have any articles in it this time around? I interviewed Jennifer Hepler for that issue. She has been a writer for major video game franchises like Dragon Age and Game of Thrones Ascent. Awesome. Still having issues with my Kobo. 😐 Looking forward to reading it! Congrats. I like the story behind the story too. I get a lot of my writing inspiration from music and lyrics so can definitely relate to this. Thanks, Faran! Yep, music is a definite short cut into story world for me.